The original painting is for sale. 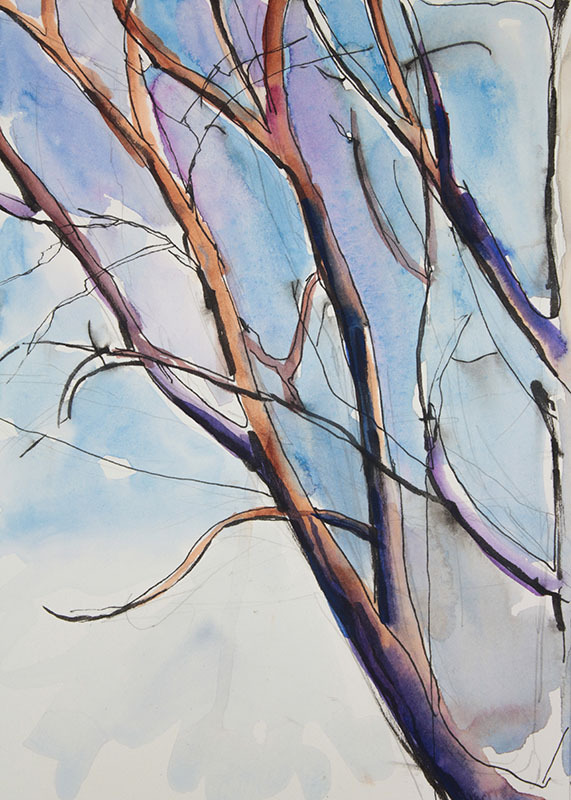 I worked on this study of a tree while I was having the brakes repaired on my car. I don't like sitting around in the waiting room mindlessly watching television, so whenever I have my car worked on I bring my watercolor supplies with me. I handed my keys to the mechanic and immediately bolted out the door to look for something to make a painting from. This tree was on a walking path not too far from the shop. I began sketching it with a micron pen, and once I was happy with the drawing I used a brush pen to thicken up up some of the lines. When I added the water to the drawing the ink began to run a little bit but I think that made it look more interesting. 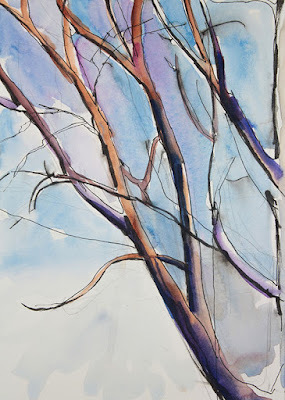 I started with the color of the sky and when that was dry I added the color of the branches. A few runners and walkers passed by me while I was working on this painting. They probably thought I was nuts, most people don't encounter artists drawing outside. I once had someone ask me if I was taking a survey. I think it's because I'm holding a board and it looks like I'm writing things down. This happened at Canandaigua Lake and I jokingly said "Yes, I'm counting how many boats are out on the lake today!"